A fossil skeleton found in a cave on Flores Island, Indonesia, in 2004 turned out to be a previously unknown, very small species of human. Nicknamed the "hobbit" (officially Homo floresiensis), it remains a mysterious species with an unknown relationship to modern humans. 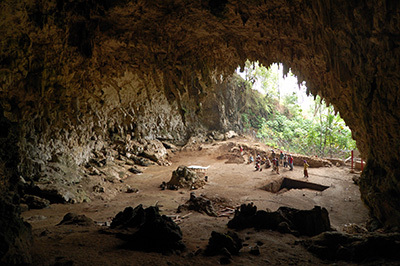 Intriguingly, the current inhabitants of Flores include a pygmy population living in a village near the Liang Bua cave where the fossils were found. An international team of scientists has now sequenced and analyzed the genomes of 32 people in this population. The analysis revealed evolutionary changes associated with diet and short stature in the pygmy population, but the researchers found no evidence of genetic elements that might have come from H. floresiensis. "If there was any chance to know the hobbit genetically from the genomes of extant humans, this would have been it. But we don’t see it. There is no indication of gene flow from the hobbit into people living today," said Richard E. Green, associate professor of biomolecular engineering at UC Santa Cruz and corresponding author of a paper on the findings published August 3 in Science. Thus far, no one has been able to recover DNA from the H. floresiensis fossils. The researchers therefore searched the pygmy genome for any evidence of DNA sequences from an unknown ancient human lineage. Green and other researchers previously recovered and sequenced DNA from fossils of other archaic humans—the Neanderthals and Denisovans—and determined that the genomes of some modern humans include DNA sequences inherited from those extinct human species. Those findings mean some interbreeding occurred in the distant past. The genomes of the Flores pygmies include small amounts of Neanderthal and Denisovan DNA, similar to other populations in Southeast Asia and Melanesia. "Genetically, they're not so different from other populations in that part of the world," Green said. Where they are different is in genes related to height and diet. Height is a very heritable trait, and geneticists have identified many genes for which certain variants are associated with taller or shorter stature. Green and his colleagues analyzed the Flores pygmy genomes with respect to height-associated genes identified in Europeans, and they found a high frequency of genetic variants associated with decreased height. This indicates that the evolution of short stature in the Flores pygmies was the result of natural selection acting on pre-existing genetic variation. "It sounds like a boring result, but it's actually quite meaningful," Green said. "It means that these gene variants were present in a common ancestor of Europeans and the Flores pygmies. They became short by selection acting on this standing variation already present in the population, so there's little need for genes from an archaic hominin to explain their small stature." Coauthor Peter Visscher at the University of Queensland, Australia, said the study addresses fundamental questions about human adaptation. "Just as livestock breeding happens through small changes in gene frequencies at very many loci, human adaptation works by exploiting the pool of polygenic variation available for selection," Visscher said. The Flores pygmy genome showed evidence of selection in genes for enzymes involved in fatty acid metabolism, called FADS enzymes (fatty acid desaturase). These genes have been associated with dietary adaptations in other populations, including the Inuit in Greenland. "It suggests that something in the past caused their diet to change dramatically, and they adapted by natural selection favoring certain variants of those genes," Green said. The fossil evidence indicates H. floresiensis was significantly smaller than the Flores pygmies, standing about three and a half feet tall (106 centimeters). The average height of the pygmies is more than a foot taller (145 centimeters). The evolution of reduced body size in large mammals isolated on islands is a common phenomenon, often attributed to limited food resources and freedom from predators. At the time of H. floresiensis, Flores was also home to a dwarf elephant related to a now extinct species of mainland elephant. In general, large species tend to get smaller and small species tend to get larger on islands. The Flores giant rat is an example of the latter tendency. "Weird things happen on islands," Green said. "With the gene pool cut off from the larger population, an island population is free to evolve in unrestrained directions based on the demands of a small ecosystem." It is interesting that two different human species, one modern and the other now extinct, independently evolved short stature on Flores Island, he said. For now, however, the origins and relationships of the Flores hobbit, H. floresiensis, remain a mystery. This research involved a large international collaboration. Green and Joshua Akey of Princeton University were the senior principal investigators, and Serena Tucci of Princeton is first author of the paper. Herawati Sudoyo and Gludhug Purnomo of the Eijkman Institute for Molecular Biology in Jakarta, Indonesia, oversaw the collection of samples for genome sequencing from the Flores pygmies, and Purnomo assisted with sample processing at UC Santa Cruz. Other coauthors include Peter Visscher at the University of Queensland, Australia; Samuel Vohr at UC Santa Cruz; Rajiv McCoy at Princeton University; Benjamin Vernot at the Max Planck Institute for Evolutionary Anthropology in Leipzig, Germany; Matthew Robinson at the University of Lausanne, Switzerland; Chiara Barbieri at the Max Planck Institute for the Science of Human History in Jena, Germany; Brad Nelson, Wenqing Fu, and Evan Eichler at the University of Washington, Seattle; and Guido Barbujani at the University of Ferrara, Italy. This work was supported in part by the Searle Scholars Program, U.S. National Institutes of Health, European Research Council, Australian Research Council, and the Ministry of Research and Technology of the Republic of Indonesia.